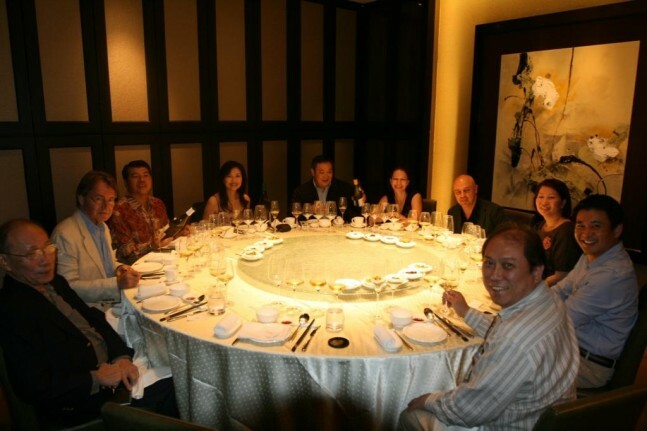 Home > Restaurants > Reflecting on Best Meals and Restaurant in the Year of the Rabbit – Part 2 – Imperial Treasure Super Peking Duck – Surely the best Peking duck to be had in all Singapore – perhaps the world! It is of course highly subjective, even perhaps an egotistical indulgence, arriving at such a defined digest of restaurant meals, when there are literally hundreds of enjoyable and commendable experiences that are indelibly lodged in the hippocampus with aromas and flavours lurking in the entorhinal cortex that contribute to my constant state of culinary delirium. Imperial Treasure Super Peking Duck – Surely the best Peking duck to be had in all Singapore – perhaps the world! I crave for duck or more specifically Chinese lacquered roast duck and need a fix at least once a week. 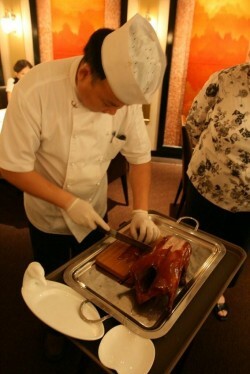 Actually, I am off to Imperial Treasure Super Peking Duck tonight, to satisfy my Mallard yearning. The truth is I am totally obsessed with any type of duck and fascinated by all manner of cooking techniques and the way different cuisines and cultures treat this most superior waterfowl. I recently had a Tandori Duck at Punjab Grill by Jiggs Kalra that enslaved the palate and senses. But it is Peking duck that I find rather special and it’s more about the skin, rather than the meat, roasted to a crisp perfection; thin, oily, butyraceous, toffee-caramel-like crunch with its smoky-meaty nuances. Served on plain ‘Spring Pancake’ (unique to northern Chinese cuisine), with fresh, finely sliced spring onion stalks, sometimes peeled sticks of cucumber and teased with Hoisin sauce, it is about as about as elementary as Chinese cuisine comes; so much so it is theatrically embellished by expert carving at the table by Wudang Swordsman Chefs and gracefully assembled and served with much ado by waiters in a well-choreographed ritual that makes the dish an ennobled experience. As uncomplicated the dish may be, it is by no means simple to cook Peking Duck with centuries-old traditions exclusive to the courts of Imperial China with their roots in the Yuan and Ming Dynasty’s; these royal methods evolving to what is believed the the first restaurant specialising in Peking Duck, Bianyifung established in the Xianyukou, Qianmen area of Peking in 1416. One does however need to make the definition between Chinese lacquered roast duck and goose, and Peking Duck although many would think they are the same, there are distinct differences both in type and size of duck and the actual ingredients and method of cooking. In my experience, Chinese lacquered duck, although cooked in a similar way, has a subtle infusion of herbal nuances in the meat from the cavity being stuffed with garlic, star anise, five-spice and other ‘secret’ ingredients. Moreover, it is normally a bigger duck with the flesh taking precedence and the leg being prized (normally set aside for Grandma at the communal table) and often served with rice and accompanied by many other dishes. Peking Duck is invariably a smaller, leaner duck and primarily from the Nanjing Pekin variety, a domesticated cousin of the Chinese Mallard duck. The cooking method differs here with less spice but also the emphasis is on separating the skin from the fat by blowing air through the neck cavity. There is also much more focus on the maltose glazing of the duck and when cooking in the ‘duck oven’ the chef will be rotating the duck more to ensure even cooking and maximum caramelization of the glazing and fat. You can imagine what nutritional experts are going to say about all this, counselling us against eating chicken skin little lone ultra-fatty duck skin that is roasted to super-concentration. Perhaps that’s why I like duck so much, it’s halfway between heaven and a heart attack and a gastronomic middle finger to all those health prudes. Further enticement of my Peking Duck addiction is the very fact it is nigh on impossible to cook at home, unless you have a duck oven or similar moreover, there is at the minimum 2 days preparation time and a considerable amount of expertise, or secret recipe, making it all the more fascinating. Needless to say, living in Singapore, there are a multitude of restaurants serving up Peking Duck to which I have been painstakingly researching, my waistline irrefutable evidence of such. The conclusion of this exhaustive research is that in my evaluation, Imperial Treasure Super Peking Duck at Paragon Mall is without question the best Peking Duck to be had in all Singapore moreover, it is the best I have experience period – and therefore arguably one of the best of its genre in the world. Furthermore, it has possibly become my favourite restaurant in Singapore, not only for my personal gratification but for the very fact I get enormous pleasure out of entertaining visiting friends and wine, food and hospitality colleagues with a 100 percent hit rate in delivering, or indeed over-delivering in an wonderfully idiosyncratic dining experience. I say idiosyncratic because the experience is both distinctive and quirky; like all good Chinese restaurants you have to learn to assimilate with the establishment and the staff and be prepared to dispense with your ‘western’ ideology of service and communication – a good time to brush up on ones Cantonese and Mandarin. Actually, I hardly speak a word of either, and although many of the staff not entirely comfortable with communicating in English, we never have a problem and they are always amused with my Cantonese nickname, ‘Lap Sap Tong’ – garbage bin! Despite all the gripes about service in Singapore restaurants (most of it founded and largely centred on a complete lack of charisma), the staff here are exemplary and genuinely friendly and personable, in brutal way. Yes, brutal or blunt, as is the Chinese vernacular and most of the time it is simply sheer efficiency and getting on with the job of eating, which is paramount. I recall on one occasion, our newly minted staff member had clearly just arrived from mainland China, although possible did a stint as a Changi prison warder before starting at the restaurant. Much to the amusement of my overseas guest, David Ridge, a heroic eater and drinker from Australia, she whipped us into shape and had us doing as exactly as we were told in no time, despite not speaking a word of English. She could have turned up at the table with thigh high black leather boots and a bull whip and neither of us would have batted on eye. It was in fact one of the most memorable nights I have had there, partly due to our correctional officer/waiter actually having an acute sense of duty (and grasp of humour as it turned out) and the Peking Duck being thoroughly on-song, washed down with a brilliant 2007 Calera Reed Vineyard Pinot Noir – a sublime match and experience. A quick note on wine pairing with Peking Duck – JUST BRING PINOT NOIR – or a little late harvest Vouvray if you want to really push the fat to the max. They are very BYO friendly here, although I often draw off their wine list which is very well priced, indeed practically retail and the selection is improving all the time although they need a lot more pinot noir. They use high quality glassware with the staff very much in tune with wine service and pouring and I am particularly impressed when we have large wine enthusiast groups here, usually in one of the private rooms at a large round table and a dedicated wine pourer that always manages to keep up with a myriad of wines. 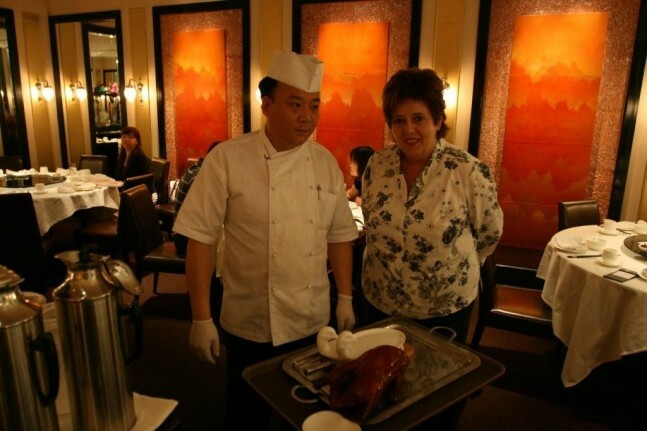 There is of course more than just Peking Duck on the menu here, but before choosing other dishes there is the etiquette of what one does with the remaining meat and carcase once the chef has expertly carved the thin slices of breast meat for filling the pancakes. Actually the ritual will begin with small slivers of skin only dipped into white sugar (not quite sure why more sweetness is required?) and eaten separately in acknowledgment of the chefs cooking prowess and the magnificence of the skins wafer thin crispiness and alluring colour. A decision must then be made whether to have the remaining meat as San Choy Bow, the meat finely chopped along with shitake mushroom and chestnut and served in Iceberg lettuce leaf, or alternatively the meat can be shredded and serve in an egg noodle dish. Many dinners will be unaware of these additional options and even more so of another final dish where the carcase is chopped up (with the typical ease of a Chinese cleaver) and the bones tossed in a hot wok with salt, pepper, garlic and touch of chilli which is thoroughly toothsome and there is no other way of eating it than just using ones hands and gnawing away at the bones. The menu at Imperial Treasure Super Peking Duck extends far beyond the bird itself, as is mandatory of Chinese restaurants of this ilk the menu is encyclopaedic; and contrary to the restaurants name, they are famous for their seafood and fresh fish, much of live or tank fresh as is conventional of the highly demanding expectations of the Chinese diner. As much as I try to avoid picking up this menu as it can consume you, sometimes it is necessary as a tool of translation. However, you are definitely better off attempting a conversation with the staff and simply determine the menu verbally as the locals do, or call over the manager for help, a charismatic chap of venerable experience and charm. If we are a larger table, I often start with deep-fired frog’s legs and ginger, a dish wonderfully simpatico with riesling picking up in the gingery spiciness at the same time cleansing the palate with requisite refreshing acidity. We might also have another course of steamed fish or some bamboo clams in garlic if there are other richer white wines to be partnered however, if it is a small group we often just stay with our duck banquet. At this juncture, it is pertinent that I detail the rules of engagement here. You must pre-order your Peking Duck when making your reservation, although they do their best to accommodate those unaware of this. And make sure you communicate clearly upon sitting down when you want the duck to be served as they are on auto-pilot here and will wheel out the bird and sword-wielding chef straight away. Also, it is one of those curious things with Chinese gastronomy that they prefer to have fish after red meat which is obviously the inverse of how western palates work and unless you tell them otherwise, you will be drinking red wine with your fish. Become a regular; like any restaurant you will build up a rapport with the staff and they reward loyalty here. And in the process of becoming a regular, make yourself heard; the Chinese are not used to being subtle or unnecessary banter at the table – be respectfully blunt and just get on with eating. My advice is to dine early, when they open at 6.30pm as you will surely enjoy more attention when the restaurant is quiet and things can get pretty lively towards the middle of the evening. I would also advise against arriving for a late dinner (sitting down no later than 9pm) as they like to wind up here relatively early and you will find the food coming out faster than desired and staff hovering over you a little too much. It is a handsome restaurant, lavishly decorated in lacquered woods and materials finishes with the private booths for two to four guests very flash and intimate. In the main dining rooms tables are spaciously set out with crisp white linen and there’s an overall swanky feel to the place, in keeping with the 5 floors of luxury boutiques housed in Paragon Mall. Imperial Treasure is of course one of the massive restaurant groups in Asia and in the sense contradicts my preference for small, owner operated establishments however, I have to say the group in its entirety, and that is every single Imperial Treasure establishment I have frequented is impeccable. It’s extraordinary really and mindboggling how they can maintain such high standards of food and service. Imperial Treasure Super Peking Duck is the standout in Singapore though and in every respect feels more like a personally owned restaurant such is the pride and professionalism of the staff directed by their veteran manager and the hard-working chefs who churn out impressively consistent, high quality food. Bravo! If you would like to experience the Imperial Treasure at its best, The Wandering Palate will be hosting a wine dinner and duck banquet with the Family of Twelve, a fraternity of 12 of New Zealand’s most successful and enduring artisanal private winemakers – from North to South Island— Kumeu River—Villa Maria Winery—The Millton Vineyard—Craggy Range—Ata Rangi—Palliser Estate—Neudorf Vineyards—Nautilus Estate—Lawson’s Dry Hill—Fromm Winery—Pegasus Bay—Felton.